If anyone tells you that the holiday season is a time of excess, point to your frugal management of food. Yes, some meals may seem extravagant, but thanks to iceboxes, cold weather and other preservation methods, nothing need go to waste. 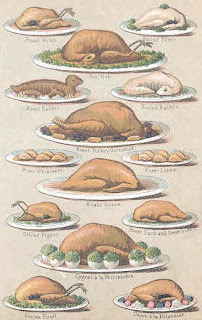 All parts of the turkey, for example, have a use. The meat can be eaten as soon as it is roasted, or it can be smoked, dried or pickled and stored for later use. Turkey bones can be saved and added to soup for flavor, or boiled further into gelatin for broths and desserts. The large feathers can be made into writing instruments; the pin feathers can stuff pillows. One may also boil the beak and feet to the same purpose as bones, or dry them for use as back-scratchers. It is a little-known fact that the turkey head also makes excellent wolverine bait and, once caught, the wolverine can protect your valuables (after you have tamed it). Likewise the fruitcake has a myriad of uses: door stopper; theatrical curtain counterweight and ship ballast, among other things. I knew a woman in Nome, Alaska, whose concerned relatives back East always sent her a good quantity of fruitcake to carry her through winter. When fuel grew low, she would toss one on the fire. It would usually burn for a week. So never look at your holiday dinner as an extravagance. If anyone criticizes the quantity of food you are serving, show them the cold storage room that you have built of stacked fruitcakes sealed with congealed gravy, containing all your smoked turkey, quill pens, pillows and back-scratchers, well-guarded by your trained wolverine. Never trust a trail cook everyone calls "Vinegar." 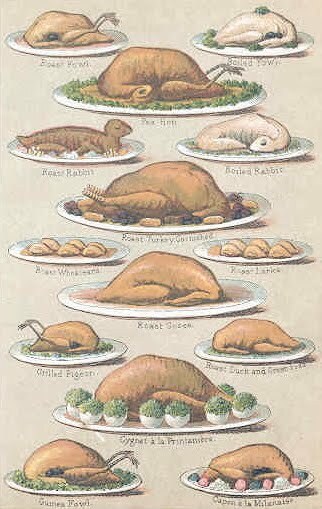 Do not assume that men familiar with fixing steak will also know how to cook a bird. Never tell a cowboy where you keep your whiskey. 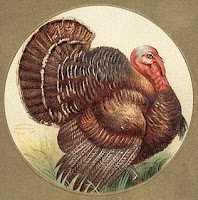 Do not add gunpowder to the cavity of a turkey, no matter how hungry you are or how much whiskey you have had. This will not hasten the cooking process. Do not weigh down a pot lid with rocks if the pot is to be placed over an open fire. This goes double if the turkey inside the pot has been stuffed with gunpowder. If invited to share a Thanksgiving meal with cowboys, make sure they understand the previous two rules. If you happen to be far afield on the eve of Thanksgiving and overtake a cattle drive, always ask if the cook is happy. If you learn that the cook has quit, and someone nicknamed "Vinegar" has taken his place, likewise excuse yourself with urgent business elsewhere. Some folks accuse me of telling untruths. That is not so. I always tell the truth, at least in part. A flat-out lie is just too dangerous by itself. I learned that from my uncle Hiram. Uncle Hiram -- may he rest in peace -- told lies without a grain of truth in them and an utter disregard for their ill effects. One day he told a whopper of a falsehood so big that it gave all his human listeners severe indigestion and their horses a bad case of colic. I will not repeat it for obvious reasons. That falsehood was so big that as soon as the sound of what he said reached his own ears, Uncle Hiram's ears swelled up to the size of dinner plates. A little later the horses expelled their colic, but with such a powerful blast of air that they blew out the windows of nearby stores, and in all the wind Uncle Hiram was beaten to death by his own flapping ears. That's why I don't tell lies. 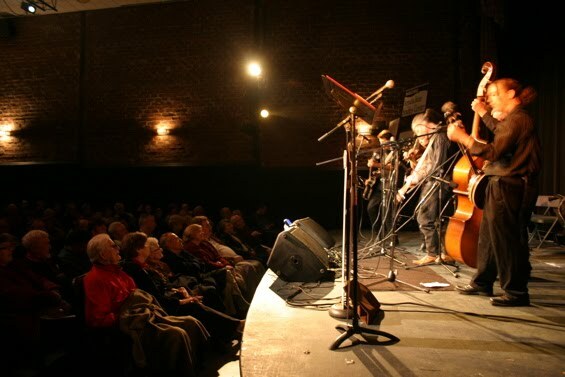 There's nothing like a brisk fall evening to bring folks inside for some good music and bad jokes. 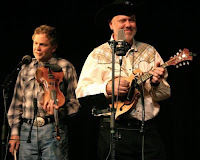 While the temperature in Dahlonega fell into the upper 30s, inside the Holley Theatre Curly Maple warmed everyone with their fast-paced, traditional and Celtic-flavored tunes, and the Tucker Station String Band (Ron and Reuben pictured at left) displayed some fine fiddling and harmonies. 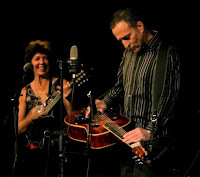 Lisa Jacobi, Pete Dasher (pictured at right) and the members of Steel String Session kept the crowd heated up with some high energy mandolin, fiddle and dobro playing. Folks who arrived early were lucky enough to hear the talented Dickerson kids sing and play traditional Appalachian tunes. The Buzzard Mountain Boys pestered me and Professor Grant with their usual nonsense; I am used to it but Professor Grant (who is a northerner) is now afraid they will apply to a local college and use him as a reference. Thanks to all the volunteers and supporters who make this show a success! I'll be back next year if the sheriff doesn't object.